1. Go to the Zecco brokerage web site and log in to your account. then click Investment Data Download. 3. 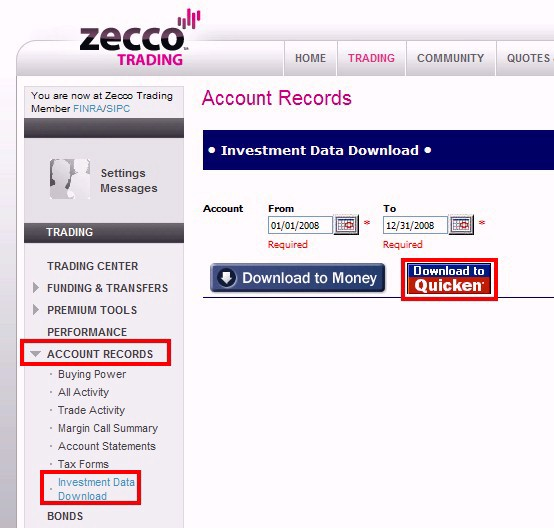 Enter a From and To date, then click Download to Quicken. 4. When prompted save the QFX file to your "c:\my documents\TradeLog\import" directory. 6. Click on the Zecco Imp speed button. 7. Select the appropriate QFX file and click on the Open button. 8. Your trades will be imported and automatically matched.